Buttermilk Substitute: Make It Work! Has this ever happened to you? You decide that you want to try a new recipe. As you review the recipe, you note that it calls for buttermilk. You pause -- do I have any buttermilk? A trip to the fridge, open the door and ... nothing. No buttermilk. Nuts! But I really, really want to make this quick bread. But I really, really don't want to go to the store just for 1/2 cup of buttermilk. What to do? I recently went through this, like this week. I wanted to try a quick bread recipe featuring rhubarb but I needed 1/2 cup of buttermilk and I didn't have any and I didn't want to go to the store. This was a classic Tim Gun "make-it-work" moment. Before I reveal the fix, let me explain why we use buttermilk in baking. There are many reasons but one of the major reasons is the acidity. The acid in buttermilk reacts with baking soda to create air bubbles. It is these bubbles which cause your quick bread or cake to rise. The acidity also reacts with the gluten in flour to inhibit gluten formation, resulting in a more tender baked good. So what did I do? First, I poured one tablespoon of fresh lemon juice into a one cup measuring cup. If you don't have lemon juice, white vinegar will also work. Then, I added skim milk to measure one cup. Stir and let the mixture sit 5 to 10 minutes. That's it! Use as you would buttermilk. The acidity from the lemon juice or vinegar will give you the same reaction that you would get from the acidity in buttermilk. You can use any milk that you have on hand. I used skim milk because that is what I always have in the fridge. How did the bread turn out? Delicious!! I'll share that recipe soon. Happy baking dear friends and as Tim Gun would say, "Make it work!" Hippity Hoppity Bunny Cookies for Easter! Good morning dear friends! Are you making plans for an Easter celebration? Today, I'm sharing with you vanilla almond sugar cookies that I've made for Easter weekend. For the past several years, I've made egg shaped sugar cookies so this year I wanted to do something a little different. Say hello to Mr. Easter Bunny! I found the bunny shaped cookie cutter online and it was the right shape and size. How do you like my design? I drew my inspiration from vintage Easter cards that I have seen online. The cheery yellow background is a lovely compliment to the pink and red rose buds, don't you think? I have been itching to try this wet-on-wet decorating technique for roses that I saw on the website for Amber Spiegel's cookie business, SweetAmbs. Have you ever seen any of Amber's cookie designs online? If you haven't then you need to check them out ASAP. Amber's designs are AMAZING!!!!!!!!!!! Absolutely gorgeous! Amber has posted a bunch of videos on YouTube where she demonstrates her decorating techniques, including (happily for me! ), her wet-on-wet rose. I watched Amber's video a few times and then I hit the kitchen. Last July, I posted a three part collection on how to make vanilla almond sugar cookies decorated with royal icing. (Cookie Art: Parts I, II and III - July 8, 15 and 29, 2016) So I won't go over making the cookies and the icing again. Today, I am just going to focus on my bunny cookies. I made a single batch of the vanilla-almond sugar cookies. Since my bunny cutter was on the smaller side (about 2-1/2 inches), I was able to get three dozen cookies out of a single batch. What do I mean by a wet-on-wet decorating technique? Well, instead of letting the yellow flood icing that I used for the background dry, I added the tinted flood icings for the rose buds and leaves immediately after applying the yellow flood icing to the cookie. The background icing is still wet thus the name wet-on-wet. Here's a close up of one of the rose buds on my bunny cookies. Can you see how many colors there are? I needed pink and red flood icings for the rose buds and two shades of green for the leaves. With the yellow icing that I needed to pipe the outline of the bunny and fill in the background, that was total of five colors of icing that I needed to make these cookies. So I made a full batch of royal icing to be sure that I had enough to complete three dozen cookies. So how do you make the rose buds? Well, I forgot to take any pics of the process (sorry about that!) as I was kind of in a groove. But fear not since Amber Spiegel has a couple of YouTube videos where she demonstrates her technique. It isn't hard to do but it is labor intensive. Each rosebud I made got 9 dots of color (one pink, two red, three light green, three dark green) Multiply that by three rosebuds for each cookie and then that number by 36 cookies in the batch and you've got a lot of icing dots! Then those dots are either swirled together (for the flowers) or pulled (for the leaves). That's a lot of hand work for each cookie but I don't mind. I love working in the calm and quiet of my kitchen making something that is as pretty to look at as it is tasty to eat. I hope that you have a happy and blessed Easter holiday that is filled with love and happiness. Happy baking, dear friends!! In the baking world (and the foodie world in general), there are certain flavors which perfectly compliment each other. Cranberry and orange is one of those perfect matches. Orange and chocolate is also a classic combination. What would happen if you mashed some of those classic pairings together? Say, cranberry, orange and chocolate? Well, you would get this delightful cookie - cranberry orange chocolate drops. This chubby cookie (who doesn't like a chubby cookie?) is a flavorful variation on a recipe created by King Arthur Flour. KAF's original recipe calls for white chocolate chips and pecans. I've substituted bittersweet chocolate chips for the white chocolate chips and I've eliminated the pecans in deference to a dear friend who has a nut allergy. Instead of the nuts, I've simply added in more dried cranberries. The orange flavor in the recipe can be supplied by either orange zest or orange oil. I've chosen to use orange oil since I have it in my pantry. KAF's recipe also suggests using espresso powder. KAF says that the espresso powder is an optional ingredient which adds no coffee flavor but which helps to balance the sweetness of the cookie, which uses both light brown and granulated white sugars. KAF also suggests sprinkling the cookies very, very lightly with fine salt before baking to further balance the sweetness of the cookie. I love salty/sweet treats so don't mind if I do use the salt. Cranberry orange chocolate drops are delicious. Each of the three flavors are clearly discernable but are not overpowering. Every time I make them someone asks me for the recipe. Would you like to give them a try? Then navigate on over to KAF's web site and check out the recipe. Note: you will want to search for "cranberry orange white chocolate drops." Enjoy! One of the first posts I wrote was about using a food scale to measure dry ingredients for baking. (See "Weigh to Measure (or how tis old baker learned a new trick!" - February 27, 2015). And I stand by that post. Weighing your dry ingredients is definitely better than using the volume measurement because it is more accurate. I'm writing an update today to show you my new OXO food scale. My first food scale many years ago was an inexpensive model that I bought at a local housewares store. I used it for a while but I wasn't really satisfied with it because it did not give measurements in grams nor did it let me fine tune measurements in pounds and ounces to the 1/8 of an ounce. So I was in search of another scale. I found exactly what I was looking for on King Arthur Flour's web site - my beloved Escali scale. This scale was exactly what I was looking for. Imperial measurements (pounds and ounces) came in 1/8 of an ounce. I could measure just ounces. I could also convert measurements to grams. Why is this important? Well, if you look at the nutritional panel on many food packages, servings are often given with conversion to grams. For example, on the side of the bag of quinoa that I buy, I am provided with the weight measurement for 1/4 cup of quinoa (90 grams). This makes measuring quinoa easy peasy. My Escali scale could accommodate up to 11 pounds and was preprogrammed with many common weight measurement conversions. We used the scale every day to measure out coffee beans for our morning cup of java and to measure out my dogs' dry kibble for the day. My Escali was an expensive tool but was well worth it. With years of daily use, my Escali finally gave out. So off to the Internet I went in search of another scale. The same Escali model that I had is still available and is still expensive. I didn't really need all that scale. I never used the preprogrammed measurement conversions and if I used a plate or large bowl to hold the food I was measuring, I had a hard time seeing the readout panel. So I looked for a more reasonably priced scale that still provided me with the measurement options that I wanted and the reliability that I need. Enter America's Test Kitchen. Have you ever seen that program? I enjoy watching it not only for the recipes but also for the kitchen equipment tests and recommendations. ATK explains its tests and what it likes about a particular item. Checking ATK's recommendations on food scales lead me to select the OXO food scale. The OXO food scale comes in two sizes - 5 pound capacity and 11 pound capacity. I didn't need the larger capacity so I settled on the smaller 5 pound capacity scale. The OXO lets me measure to the 1/8 of an ounce AND to the gram, both of which I need. Plus the read out panel can be pulled out from the scale so that you can read it if your measurement vessel (plate, bowl, etc.) hangs over the edges of the scale. You can also use the zero button when you are measuring multiple ingredients in the same bowl. Plus, the small size of the scale makes it easy to store in a drawer. Finally, the OXO 5 pound food scale was available for a very reasonable $29.95 at my local Target store. So, if you are in the market for a food scale, you may want to consider the OXO 5 pound scale. Happy baking dear friends! The Internet abounds with cookie recipes of all types. And I for one enjoy perusing those recipes in search of something new and different. But sometimes what I really want is an old favorite, a classic cookie that I have loved for as long as I can remember. So, today I'm going to feature a recipe for one of my all time favorite cookies: Classic Peanut Butter Cookies. This simple recipe is from my favorite baking source, King Arthur Flour. You can whip up a batch of these sturdy and substantial cookies in about an hour, start to finish. Are you ready? Here we go! As always, we start by preheating the oven to 350 degrees so it will be ready when you have your dough mixed together. As your oven is heating up, measure out all of your ingredients. This is called mis en place and it really does help to prevent mistakes in putting your cookie dough together. Measure out 1-1/2 cups AP flour, 1 teaspoon baking soda and 1/2 teaspoon table salt in a bowl and set it aside. Next, in the bowl of your mixer place 1/3 cup of solid vegetable shortening (I like to use Crisco baking sticks), 1/2 cup granulated sugar, 1/2 cup light brown sugar, 1 large egg, 1 teaspoon vanilla extract and 3/4 cup of supermarket style smooth peanut butter, such as JIF or Skippy. Side bar - this is a recipe where using a food scale to measure ingredients comes in handy. Measuring ingredients like shortening and peanut butter can be messy if you are using a measuring cup to do it. If you use a scale, however, all you have to do is scoop 7 ounces of peanut butter directly from the jar into the bowl. Similarly, you need 2 ounces of solid vegetable shortening. You know that you have the proper amount of peanut butter and shortening AND you don't have to wash the measuring cups! Okay, so back to the recipe. Beat together the peanut butter, shortening, both sugars, the egg and vanilla until they are combined and smooth. Scrape down the sides of the mixing bowl and then add in the flour, baking soda and salt. Mix at a slow speed until the dry ingredients are thoroughly combined with the peanut butter mixture. This is a rather dry cookie dough so it may take a few minutes for this to occur. If your dough does not seem to be coming together, add a small amount of water to the dough while the mixer is running to bring the dough together. Don't add too much water!! Just drizzle it in a little at a time. I have found that I need to add only about a tablespoon of water to bring the cookie dough together. When your dough is ready, drop a tablespoonful of dough onto a parchment lined baking sheet. Repeat this process, spacing your cookies about 2 inches apart. Then use a fork and make the classic cross-hatch design on top of each cookie, flattening the cookies to about 1/2 inch thick. Slide the loaded baking sheet into the oven and bake the cookies for 12 to 16 minutes until the edges of the cookies are barely brown. These cookies will really puff up in the oven. Be careful not to over bake them. You want them to have that chewy texture in the center that is so often found in cookies made with vegetable shortening. Remove the cookies from the oven and let them cool on the baking sheet for 3 minutes before transferring them to a rack to cool completely. Mmmmmmmm! Freshly baked classic peanut butter cookies. Where's the milk? Enjoy! They say that the first step in beating any addiction is admitting that you have a problem. Well, I have a problem but I have absolutely NO INTENTION of trying to kick it! I am a cook book addict. I just can't help myself. I have cook books for all kinds of things. Bread, cakes, pasta, veggies and, of course, COOKIES!!! My favorite cookie book is, hands down, Rose's Christmas Cookies. Lora Brody's Rugelach - yum! Published by Rose Levy Beranbaum in 1990, I purchased this book for one specific recipe which I make every Christmas - Lora Brody's Rugelach. (More about that recipe in a minute.) A co-worker had made those rugelach and brought some into the office to share. I just loved the perfect balance of the cookie - flaky and tender cream cheese pastry rolled around a filling of apricot preserves, white and light brown sugars, cinnamon, golden raisins and chopped walnuts. I asked for the recipe and was directed to Rose's Christmas Cookies. Thumbing through the recipes, there are many things to recommend this book. Measurements for ingredients are given both by volume and by weight (ounces and grams). 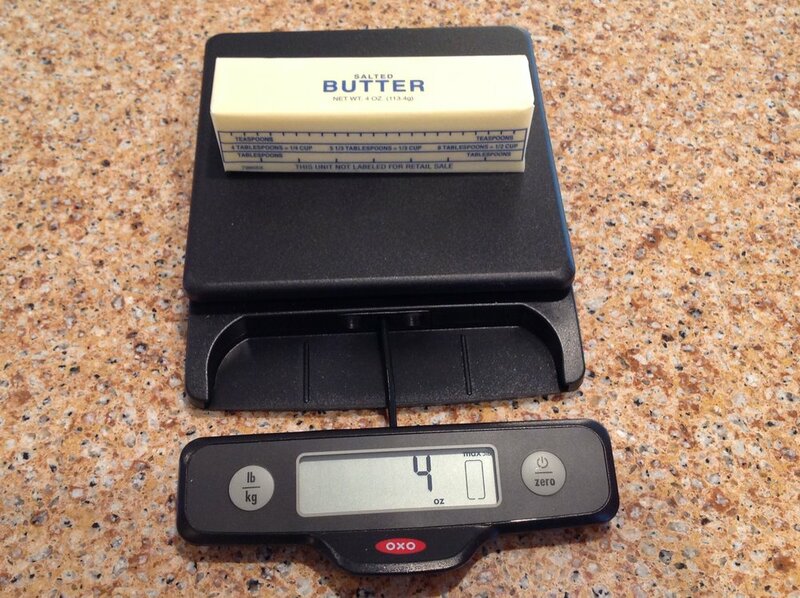 For example, a recipe calls for butter - 1 cup (by volume) or 8 ounces/227 grams (by weight). Most recipes include multiple mixing directions depending on which appliance you may have to make the cookie. What do I mean by that? Say you want to make rugelach using an electric mixer, directions are given for that. Wait, Gloria, I don't have an electric mixer but I do have a food processor. Okay, directions are given for mixing rugelach dough using a foodprocessor. Back to the rugelach. I usually make the dough a couple of months before Christmas and throw it in the freezer. The day before I want to make the rugelach, I take the dough out of the freezer and let it thaw out in the refrigerator overnight. 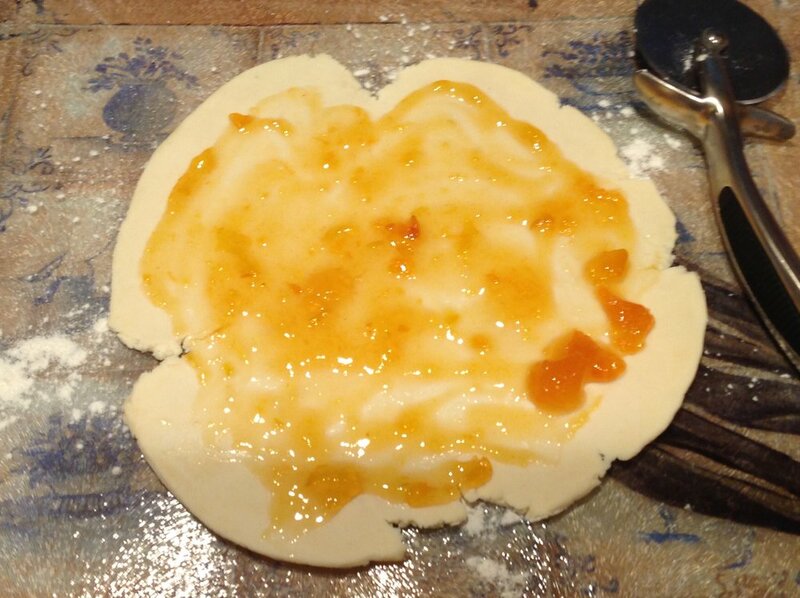 After rolling out a portion of the dough, you spread on about 2 tablespoons of apricot preserves. 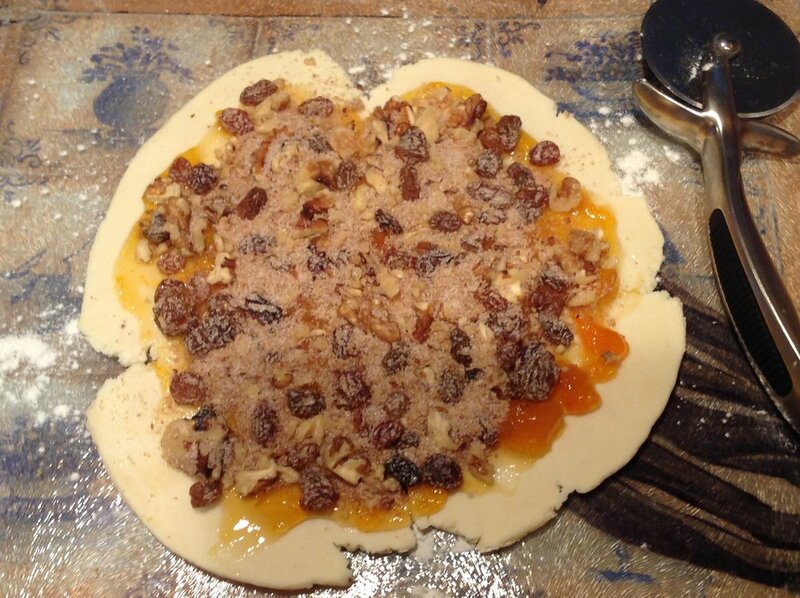 Then you sprinkle on 1/2 cup of the sugar/raisin/walnut mixture. After shaping, the cookies are chilled on the baking sheet for 30 minutes or until firm. This step is crucial as it helps the cookies to hold their shape during baking. Before baking, brush each cookie with milk and sprinkle on a cinnamon sugar topping. Bake the rugelach in a 350 degree oven for 16-18 minutes. I let the cookies cool a few minutes on the baking sheet before sliding the parchment with the cookies off the sheet to cool before storing them at room temperature in an air tight container. These rugelach are delicious. In fact, they are my husband's favorite Christmas cookie. However, they are just one of many wonderful cookie recipes you can find in Rose's Christmas Cookies, just one of my favorite things. Happy New Year dear friends!! I hope that your holidays were happy and bright and filled with the joy that comes from spending time with family and friends. With the holidays just past, I have a question for you. Is there a dish or treat in your family recipe box that always makes an appearance during a certain time of year? I have a bunch of recipes like that and today I'm going to share one with you that I make for breakfast on Christmas Eve. It is called Maple Bacon Biscuit Bake and it is delicious!! I came across this King Arthur Flour recipe about 7 or 8 years ago and is sounded so good to me. It is really simple and hits the spot when you are craving something salty sweet. Maple Bacon Biscuit Bake resembles sticky buns. A topping of crispy bacon and maple syrup is spread into the bottom of the baking pan and then topped with buttermilk biscuits. Once they are baked, the whole thing is inverted onto a serving plate. MMMMMM!! Doesn't that look delicious? If this looks tasty to you, read on! I like to do the mis en place for this dish the day before I plan to serve it. That way, in the morning, everything is ready to go. The first step to baking any recipe is preparation of the pan. For these biscuits, you will need either a square or round baking pan. I prefer a square pan because the shape makes it easier to fit in my old standby, baking parchment. Believe me, if you want to avoid leaving half of the bacon/syrup topping in the bottom of the pan, you want to use baking parchment. Also, your pan should be at least 2 inches deep to prevent oozing of the topping out of the pan. You don't want that mess in your oven! So, butter you baking pan. Then press in a piece of baking parchment that you have cut to fit with tabs overhanging the side of the pan. The tabs will help with clean removal of the biscuit bake from the pan. You then need to grease the parchment paper. You oven should be preheated to 475 degrees. In a small bowl, mix together a half pound of bacon (8 slices) which has been cooked until crispy and medium brown and crumbled, 1/3 cup brown sugar, 1/4 cup AP flour, 1/4 cup maple syrup and 2 tablespoons melted butter. This mixture is thick and sticky. Spread the bacon/syrup mixture onto the bottom of your prepared pan as best you can. Don't worry about making it even. Just get it close. Now for the biscuits. In a large bowl mix together 2 cups of AP flour, 2 teaspoons of Bakewell Cream, 1 teaspoon baking soda, 1/2 teaspoon salt. If you don't have Bakewell cream in your cupboard, use 2 teaspoons baking powder and omit the baking soda. To this mixture, cut in 1/4 cup of cold butter. You want this mixture to be crumbly. I start out using a pastry cutter then switch to my fingers. Add one cup of cold milk or buttermilk. I prefer buttermilk but use what you have in your fridge. Stir the milk into the dry ingredients to create a sticky dough. Next, drop the dough onto the bacon/syrup mixture in the pan. You want about a tablespoon of dough for each biscuit. I use a tablespoon cookie scoop to make this process easier. Slide the pan into the oven and bake the biscuits for 10 minutes. After 10 minutes turn off the oven but leave the pan in. Keep the pan in the oven for 5 to 10 minutes more until the biscuits are golden brown. As soon as you remove the pan from the oven, invert the biscuits onto a serving plate. If you used parchment paper, the biscuits should come out fairly easily. Then, carefully peel the parchment paper off the biscuits. 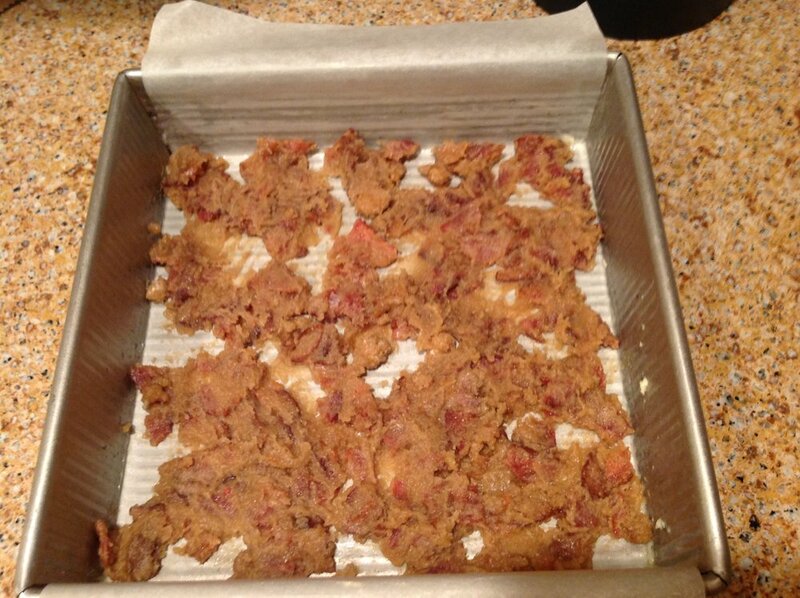 If any bacon sticks to the paper, scrape it off and put it back onto the biscuits. There you have it! Your maple bacon biscuit bake is ready to serve! Grab a fork and dig in! The biscuits are light and airy and the perfect companion for the salty sweet bacon/syrup topping. My husband looks forward to having these biscuits on the morning of Christmas Eve with a cup of fresh hot coffee. It is a new year! So give these easy biscuits a try. You may find a new tradition! As a child, Christmas was always a special and exciting time. Of course, anticipating the arrival of Santa Claus and seeing presents under the tree on Christmas morning was a focal point of the season. But growing up in a Catholic family, my parents also made sure that we understood that Christmas was not just about Santa and Rudolph and presents. We also knew that Christmas was about the birth of Christ. 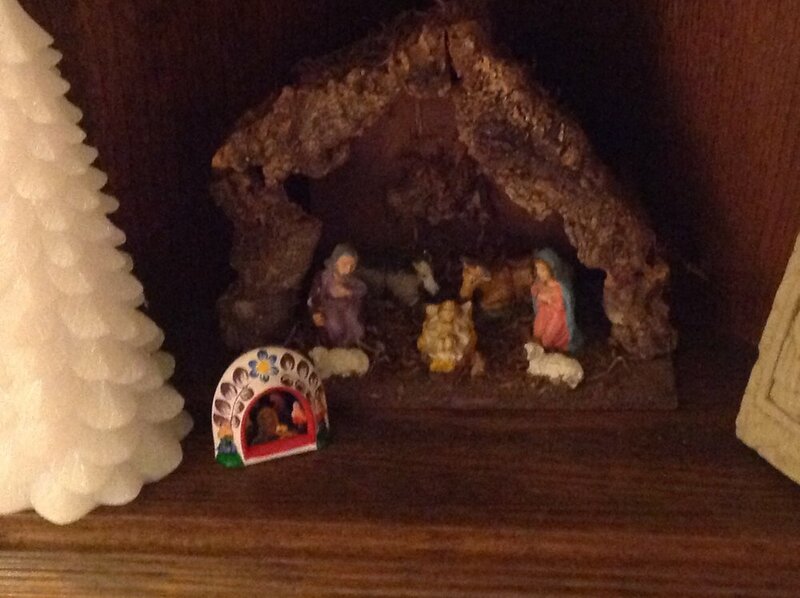 My mom displayed Nativity scenes in our home during the Advent and Christmas season. I always loved looking at these displays and as I got older and had a home of my own, I started to collect Nativity scenes. In all sizes and forms. 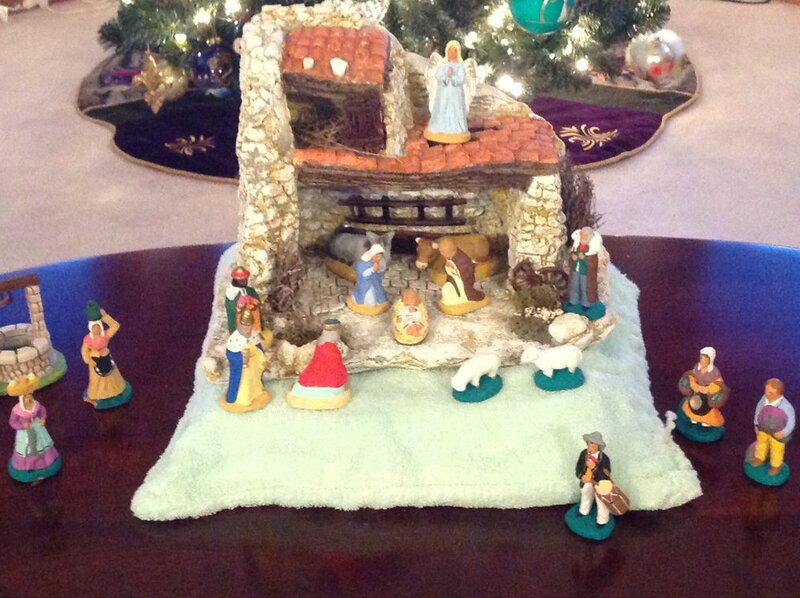 I remember two manger scenes that my mom put out. One was hand carved olive wood from the Holy Land. My sister has that scene. The other scene is shown above. My mom bought figures from the 5 and dime store and then she covered them with fabric. I remember her sitting at the card table in the family room gluing the fabric to the figures. She used a toothpick to tuck and shape the fabric to follow the folds in the clothing on the figures. 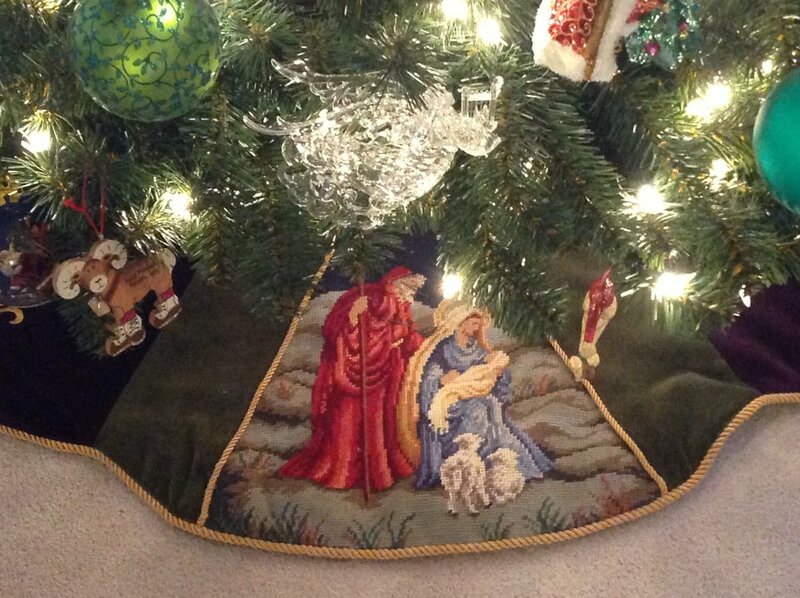 You can really see this on Joseph and Mary's cloak in the back. The baby Jesus is wrapped in his swaddling clothes. 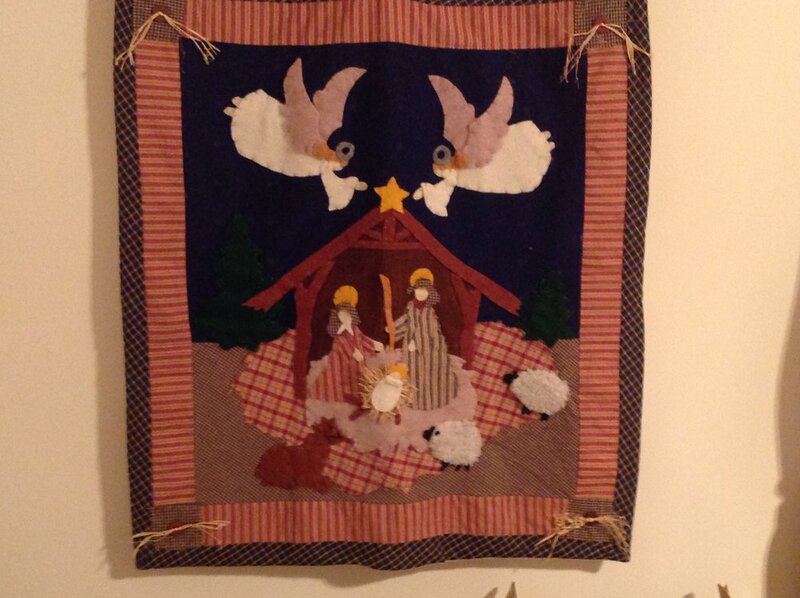 For the Magi, my mom used richer, brighter colored velvet as would befit their royal status. She applied cotton to emulate fur trim on their cloaks and added rhinestones and seed pearls. Today, I display more than 30 (yes, that's 3-0!) 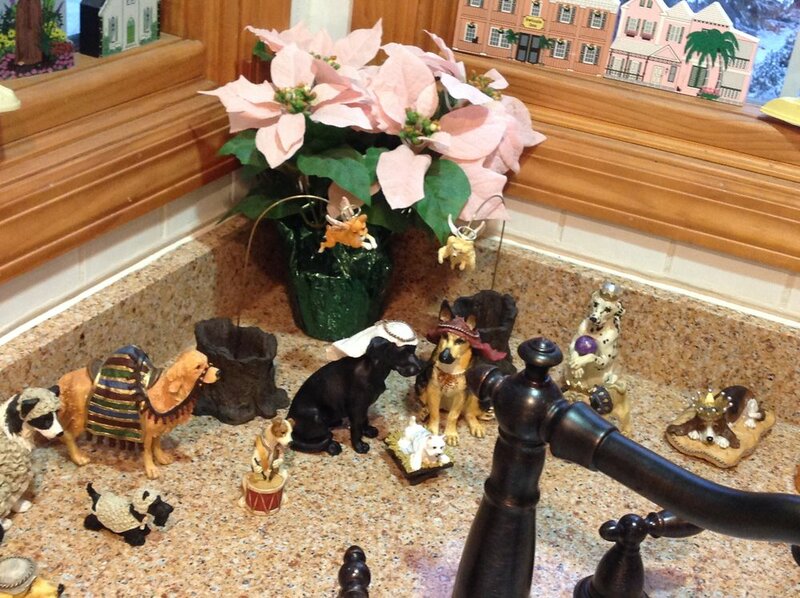 Nativity scenes in my home. 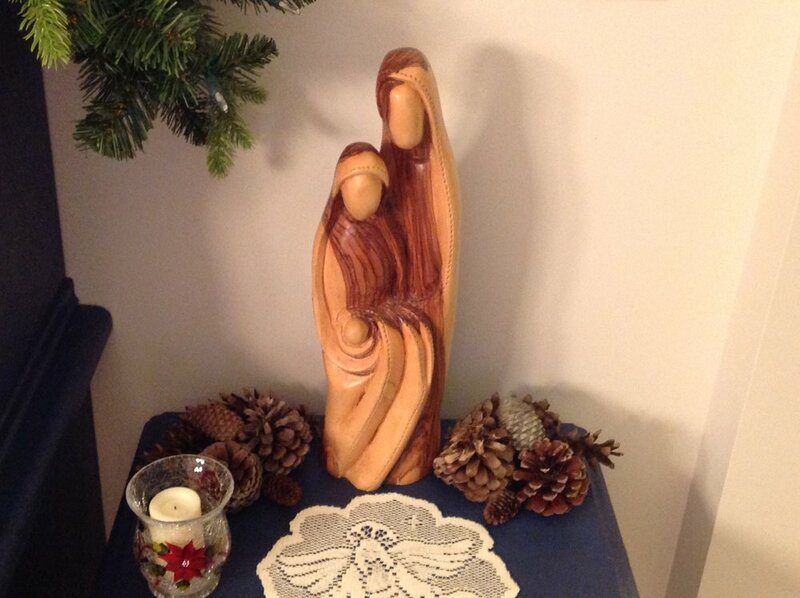 From traditional scenes by Fontanini, Willow Tree and Waterford to pictures, pillows and trees skirts, large and small, the Nativity is in nearly every room. 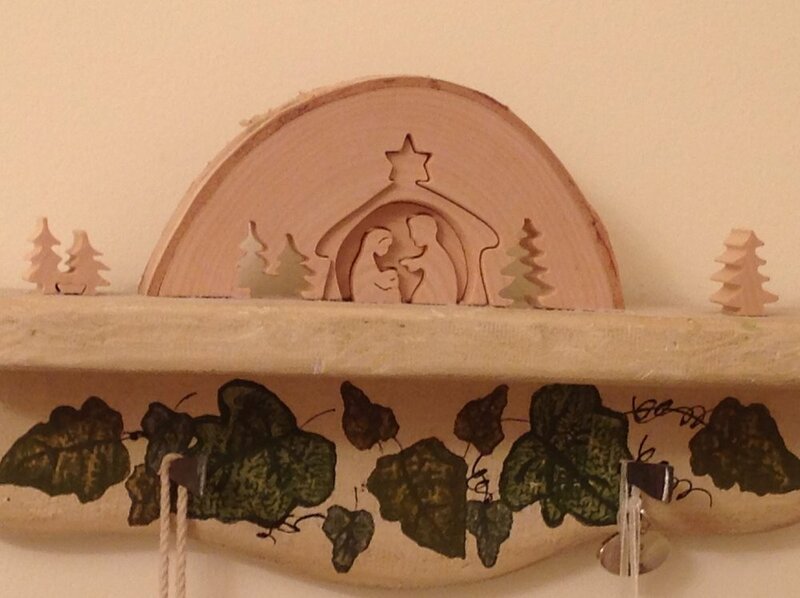 Don't ask how many Nativity ornaments there are on my tree. I can't even begin to guess. 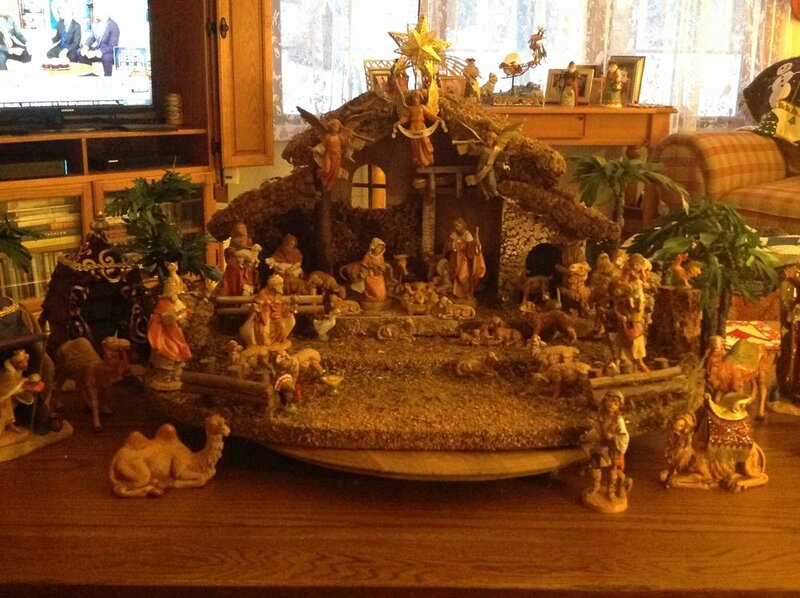 One Nativity scene that I don't have is a large scene for the front yard. There are many beautiful yard scenes in my community but my favorite by far is so impressive that it leaves you speechless. 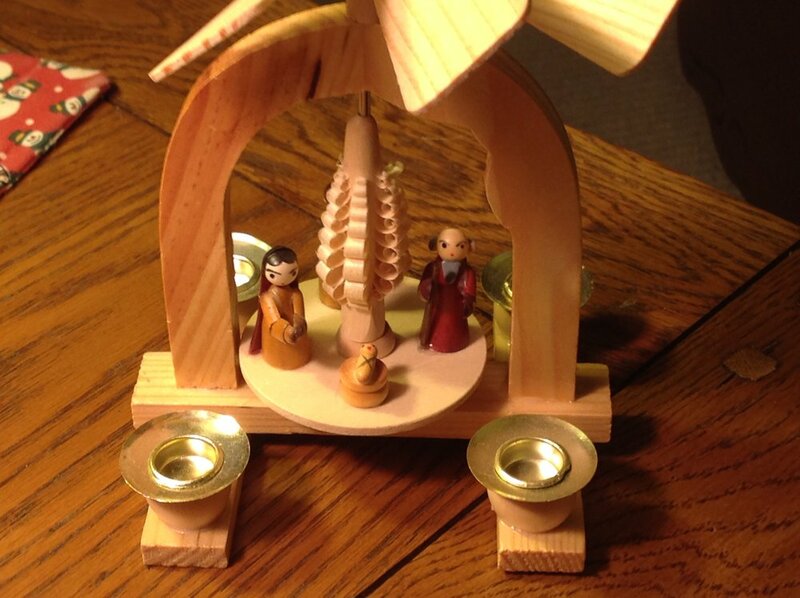 The photo I have below does not do this Nativity scene justice. The display covers the entire front yard of this home. I wish you could see it lit up at night. There are gas lamps that flicker and glowand a huge Christmas star suspended high in the air. 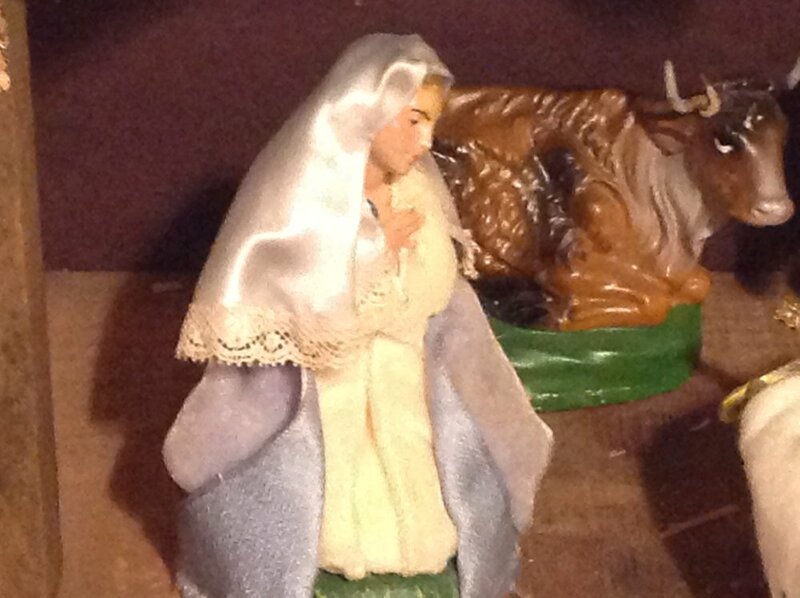 I will leave you with a slideshow of some of my Nativity scenes. Merry Christmas my dear friends. I've always been a huge fan of pizzelles. These delicate waffle-like cookies come in many flavors but my preference is for the traditional anise flavor. I had never made pizzelles until about 10 years ago. Around the holidays, the Pittsburgh Post-Gazette publishes several articles in the food section devoted to holiday baked goods. I look forward to seeing the recipes and I've often found some really, really good recipes which have become favorites in my family. I came across a recipe for traditional Italian pizzelles and decided to give it a try. The cookies are delicious and easy to make but you will need a pizzelle iron. Oh, for best results you will also need two days for this recipe. Two days?? This is quick?? Yes!! Read on and you will see what I mean! As I said, I found this recipe in the local newspaper. That's my copy to the right. The recipe as written calls for ONE DOZEN EGGS!!! That's if you want 10 to 12 DOZEN cookies. That's a lot of pizzelles! I always make a 1/2 batch of pizzelles. In order to avoid making mistakes in measuring, I wrote the amounts needed for a 1/2 batch on my copy of the recipe. In addition to eggs, these cookies call for sugar, melted Crisco sticks, AP flour, salt and either anise extract or anise oil. I also like to add fennel seed to the batter to boost the anise flavor. Mixing the batter is easy. Now, this is important. For best results, you need to mix the batter and then refrigerate it covered for about 24 hours. Why the long rest after mixing? I read somewhere (can't remember where!) that resting the batter 24 hours allows the gluten in the AP flour to strengthen. If you bake your pizzelles immediately after mixing, the cookies will be full of holes and cracks and will fall apart. I have not tested this theory myself but given my experience with gluten in bread dough, it makes sense. I can tell you that I have always let the dough rest for 24 hours and my cookies always turn out perfect. Here's my batter after its 24 hour rest, ready to go! I have an electric pizzelle iron which makes two cookies at a time. Prepare the iron according to the manufacturer's instructions. Mine needs a quick spritz of PAM at the start of baking. After the iron is heated, drop a teaspoonful of batter onto each grid and close the lid. 26 seconds is all it takes for the baking to be complete. After 26 seconds, lift the lid to reveal two pretty pizzelles! Using a silicone spatula, lift the cookies from the iron to a plate. Take care, the cookies are very soft and pliable. Repeat the process by dropping two more scoops of batter onto the iron and closing the lid. Transfer the cookies to paper towels to cool completely. The pizzelles firm up quickly as they cool. That's it! Keep going until you have used all of the batter. I let the cookies sit out on the paper towels for a couple of hours before storing them in a plastic bag. Do you like pizzelles? Maybe you have a family recipe that you would be willing to share? I would love to hear from you! Enjoy these cookies, dear friends! Happy holiday baking! My favorite season is here - Christmas! People are happy, smiling secret smiles about the perfect gifts they are planning for their loved ones. Houses twinkle with lights on trees and shrubs. Electric candles in the windows hint at homey warmthwithin. It is a time of reflection, of giving, of cherishing those near and dear to you. As a baker, I happily pull out the family recipe box for those recipes that we only make for the holidays. Those recipes usually have a connection with family history, our childhood or cultural traditions. For me, childhood memories of Christmas treats smell like ... nutmeg. Decorating nutmeg sugar cookies, sneaking a nutmeg rum log and feeling grown up because it has rum in the frosting, or enjoying a piece of nutmeg feather cake. A couple of weeks ago I made a batch of those nutmeg rum logs. They are now suspended in time in my freezer, waiting for holiday cookie trays. I have established new traditions to complement those from my past. Every year I make loaf upon loaf of chocolate bread. These delightful loaves get tucked into every gift box I mail to family. Chocolate bread is the centerpiece of every cookie tray I deliver. I also have made my own sea salt caramels the past five or six years or so. Last year, I coated those caramels with bittersweet chocolate. That was my husband's idea. Turns out this was a pretty darn good idea. Caramels that I didn't think could get any better are now Over. The. Top. Do you have traditional recipes that you make every year? I would love to hear from you! What treats do you absolutely, positively have to have every holiday season? Get baking - tis the season!! What's not to love about pound cake? No fancy ingredients needed here. Chances are you already have what you need in your pantry. Butter, eggs, eggs and more eggs, buttermilk or sour cream or cream cheese or milk, flour and flavorings. Maybe some fruit, fresh or dried. Or not. A well crafted pound cake is truly one of life's simple pleasures. Serve it plain. Or with fruit and whipped cream. It's up to you. The past couple of years, pound cake was the base of a lovely cranberry orange trifle that I served for Christmas dessert. The recipe for the trifle can be found on one of my favorite blogs, Between Naps on the Porch. I opted to make my own pound cake for the trifle. The recipe that I used? Velvet pound cake on King Arthur Flour's web site. This cake is moist and rich from butter, cream cheese and 5 eggs. Vanilla and almond extracts combine in perfect harmony to make this pound cake intensely flavorful. Velvet pound cake is the quintessential dessert when you are craving a piece of cake with a cup of tea or coffee. In the summer, when fresh peaches are abundant in the local farmer's markets, Fresh Peach Pound Cake is an outstanding choice. This pound cake combines peaches and nutmeg, a match made in heaven in my book. Butter, 6 eggs and sour cream together with diced peaches come together in a moist cake with a smooth crumb. This cake will not last long when you serve it at a barbeque or Fourth of July party. What about fall flavors in a pound cake. To be honest, I didn't really put fall flavors together with pound cake in my mind. Then, I saw the recipe for the Molasses Pound Cakepictured above in the 2016 Holiday edition of Sift magazine. Molasses, cinnamon, allspice, cloves and mace combine for a not-too-sweet spice cake that is luxurious and delicious. Stir in raisins and diced candies orange peel to elevate this cake to holiday dessert status in a hurry. This baked delight is definitely going to be featured prominently in my fall and holiday baking this year. Do you have any favorite recipes for pound cake? Let me know! I would love to try them out. Happy baking! Autumn Baking with Nordic Bakeware - Pumpkins, Maple Leaves and Acorns, Oh My! Way back in January, I showed you some of the fun seasonal bakeware that I own. Nordic Bakeware of Minnesota manufactures some the most beautiful bakeware around and it's made right here in the U.S. of A. (See my post from January 22, 2016) Today, I am featuring a quintessential fall treat that I made using a few of the autumn themed baking pans that I have in my collection - Pumpkin Muffins. Autumnal themes baking pans by NordicWare. As you can see, I used three different pans to make these muffins. The pumpkin pan yields one dozen muffins. There are six wells in the leaf pan and the acorn cakelet pan gives you 18 bite-sized treats. Don't you just love Nordicware? The recipe for this week's baking session was included with the NordicWare pumpkin muffin pan. As with most muffin recipes, dry ingredients are combined in one bowl, wet ingredients in another and then the wet ingredients are added to the dry ingredients and stirred together. Okey dokey, bakers, let's begin! BTW, I doubled the recipe that I am sharing with you in this post. The quantities listed below will yield a single batch or one dozen muffins. While your oven preheats to 375 degrees, spray the wells of your baking pans with Baker's Joy or some other shortening spray with flour. In a bowl, stir together 1-1/2 cups AP flour, 2 teaspoons baking powder, 1 teaspoon baking soda, 1 teaspoon ground cinnamon, 1/4 teaspoon ground nutmeg, 1/4 teaspoon ground ginger and 1/4 teaspoon salt. In a separate bowl, beat together 2 eggs and 1/3 cup brown sugar, either light or dark, your preference. Beat the eggs and brown sugar until thoroughly combined. Then beat in one can (15 or 16 ounce) of 100% pumpkin (NOT pumpkin pie filling!) and 1/4 cup of salted butter, melted. Add the pumpkin/egg mixture to the flour mixture and stir to combine. Then stir in 1/3 cup of toasted pecan pieces. NOTE - I substituted 1/3 cup dried cranberries for the pecans because I have a friend who is allergic to nuts. Scoop the batter into the wells of the prepared pans. This is a thick batter so you need to smooth it out in each well to ensure that the well is filled evenly. Be careful not to overfill the wells of the pans! Too much batter will cause the muffins to overflow. I found that filling the wells just under 3/4 full will keep the batter where it belongs. Slide the filled pans into the preheated oven. Okay, baking times depends on the size of the wells in the pan. For the pumpkin and maple leaf pans, bake the muffins about 20 minutes. The wells in the acorn pan are significantly smaller so the muffins will bake faster. I found 12 minutes to be sufficient for the acorn shaped muffins. Regardless of which pan you use, the muffins are done when a toothpick inserted into a muffin comes out clean. Remove the pans from the oven and allow the muffins to cool in the pans for about 5 minutes before turning them out on a rack to cool completely. NordicWare's recipe for these pumpkin muffins calls for a cream cheese glaze on the finished muffins. I chose not to add the glaze. And that's it!! Pumpkin Muffins with dried cranberries. The perfect fall treat with a cup of coffee, tea or hot chocolate. Enjoy! Last week, we talked about the benefits of using freshly grated nutmeg. Today, I am pulling out a Christmas cookie recipe from the family recipe box which features the wonderful flavor of nutmeg - nutmeg rum logs. This delectable butter cookie is spiced with freshly grated nutmeg and topped with a rum flavored butter cream frosting. Scoring the frosting with the tines of a fork and sprinkling with grated nutmeg yields a cookie which resembles a miniature buche de noel. Would you like to add this cookie to your holiday baking list? Okay! Let's bake! The recipe for nutmeg rum logs that I use appears in a cookbook I have called Cooking Under the Arch, which is a collection of recipes published in 1980 by the mother's guild of my high school alma mater, Archmere Academy in Claymont, Delaware. My mom used a similar recipe that she cut from a magazine. When I pulled out Mom's recipe, I saw a hand written note where she referred to the recipe in Cooking Under the Arch and commented that it was better than the recipe that she had used. I can't say if one recipe is better than the other because I only used the recipe from the Archmere cookbook. For this recipe, you will need one cup (2 sticks) of SALTED butter, softened. Please note that use of salted butter is imperative here because there is no other salt in the recipe! You also need 3/4 cup granulated sugar, 1 large egg, 2 teaspoons vanilla, 3 cups of AP flour and 3/4 teaspoon (freshly grated!) nutmeg. That's it, except for the frosting which we will discuss below. These cookies are so simple but so delicious! As with most recipes, start by preheating your oven to 350 degrees. In a medium sized bowl, whisk together the AP flour and the freshly grated nutmeg. In your stand mixer, cream the softened butter. With the mixer running, gradually add in the sugar and continue beating until the butter/sugar mixture is light and fluffy. Beat in the egg and vanilla extract. Be sure to periodically scrape down the sides of the bowl to ensure that the ingredients are thoroughly combined together. Add the flour/nutmeg mixture to the bowl in three additions, mixing well after each addition. You will have a soft, pliable dough which is super easy to handle. Your dough is now ready for shaping. Take a small portion of dough and using your hands roll it out in a long strand about 1/2 inch in diameter. Using a plastic dough scraper, cut the strand into 3 inch pieces. I like to use my rolling mat from King Arthur Flour for this. The measuring tape along the bottom edge of the mat makes it easy to cut cookies of equal length. Place each cookie on a parchment lined baking sheet. Be sure to leave sufficient space between the cookies as they will flatten and spread during baking. I like to put one dozen cookies per baking sheet. Bake the cookies about 12 minutes or until they start to brown along the bottom edges. Remove the cookies from the oven and allow them to cool on the baking sheet for 3 minutes before sliding the parchment with the cookies onto a cooling rack. Allow the cookies to cool completely before mixing and applying the frosting. This recipe makes 3 dozen cookies. For the frosting you will need 1/3 cup of SALTED butter, softened. As with the cookies, you must use salted butter for the frosting as there is no other salt in the recipe. You will also need 2 cups of 10x confectioners' sugar, 1 teaspoon vanilla, 2 teaspoons rum flavoring and 2 tablespoons milk or light cream. I use skim milk because that is what I have in the fridge. I also use Lorann rum baking emulsion. Baking emulsions are flavorings made by Lorann to be used exactly the same way that you use an extract. The difference is that extracts are alcohol based while bakery emulsions are water based. I find the flavor in this bakery emulsion to be more intense. If all you have is rum extract, no worries. Your frosting will be delicious! Put all of the frosting ingredients into a small bowl with tall sides and beat them together until smooth and creamy. I use my hand mixer for this frosting. Spread the top and side of each cookie with a liberal amount of frosting. Don't worry about making the frosting perfectly smooth. After you have frosted all of the cookies, go back and score the frosting with the tines of a fork. This creates texture on the cookie which resembles tree bark. It is important to frost all of the cookies before scoring them with a fork. The amount of time it takes for you to frost all of the cookies will allow the frosting to set up slightly so that when you run the fork tines through the frosting, the marks will be more pronounced. Finally, using your microplane and a whole nutmeg, grate some nutmeg onto each cookie. Allow the frosting to dry for 3 to 4 hours before packing the cookies in single layers divided by wax paper. Note: These cookies freeze beautifully! This makes them a natural for baking and freezing before the holidays. Voila! Miniature buche de noel! I wish you could reach into your computer screen and pick up a cookie to try. I guess you'll just have to bake up a batch of nutmeg rum logs for yourself! Enjoy!! As the year hurtles into November, a baker's thoughts naturally turn to the holiday season at the end of the year. For me, the flavor profile of the holiday season is topped by nutmeg. Many family recipes for holiday cookies and cakes feature nutmeg. Nutmeg sugar cookies, nutmeg feather cake and nutmeg rum logs are just a few of the recipes that leap to my mind. Exotic and assertive, nutmeg flavors both sweet and savory dishes. But what is nutmeg? Used in ground or powdered form, nutmeg is the seed of an evergreen tree that is native to Indonesia. Nutmeg is readily available in powdered form but I prefer to buy whole nutmeg and grate it myself as needed. Grating a whole nutmeg ensures the freshest flavor for your dessert or dish. Nutmeg is easy to grate yourself. There are graters and other gadgets specifically dedicated to nutmeg. I prefer to use a microplane, which is one of my essential baking tools. A microplane is a type of grater. It has very small, sharp teeth which yield a finely grated product. Can you see the teeth in the photo to the right? Microplanes can be used for zesting citrus fruit and grating cheese as well as grating nutmeg. By the way, that's a whole nutmeg there on the microplane. Be careful when you are using a microplane - those teeth are very sharp. Take it from me, catching a fingertip on those teeth hurts! Whole nutmeg does not have a hard shell or anything like that. You can grate a teaspoon or two of nutmeg in no time at all. And the aroma is simply divine. As we go deeper into fall and the holiday baking season, you'll notice that nutmeg will appear in many of the recipes that I'll be making. I just love it and I hope that you will too. Happy Baking! A couple of weeks ago, I made a batch of biscotti that just screams fall - Harvest Pumpkin Biscotti with cranberries and cinnamon chips. I'm one of those people that love just about anything that is pumpkin spice flavored. The recipe for these biscotti was created by King Arthur Flour and can be found on its website. I made a few modifications to the basic recipe by adding more of the pumpkin pie spices 'cuz I love them so much and by adding in cinnamon chips and dried cranberries. I love the bright burst of cinnamon flavor that the chips add and the sweet/tart chewy goodness that only dried cranberries can provide. I also reduced the amount of time for the second bake of these biscotti to 25 minutes from the 40-45 minutes called for in the original recipe because I like my biscotti to be a little softer and chewier. Are you ready to give these biscotti a try? Let's bake! Here's what you need: 4 tablespoons softened salted butter, 2/3 cup granulated sugar, 2-1/4 teaspoon pumpkin pie spice OR 3/4 teaspoon each ginger, nutmeg and allspice, 1 teaspoon cinnamon, 1-1/4 teaspoon baking powder, 1/2 teaspoon table salt, 1 large egg, 1/2 cup pumpkin puree, 2 cups AP flour, 1/2 cup cinnamon chips and 1/2 cup dried cranberries. Preheat your oven to 350 degrees. In the bowl of your mixer, beat together the butter, sugar, your spices, the baking powder and the salt. You want this mixture to be smooth and creamy. To the butter/sugar mixture, add in the egg and the pumpkin puree and beat until fully incorporated. With mixer at low speed, add in the AP flour and mix until the dough is smooth. Next stir in the cinnamon chips and dried cranberries. You will have a soft, sticky dough. Divide the dough in half and shape each half into a 10 inch by 2-1/2 inch rectangle on a parchment lined baking sheet. Each log should be about 1/2 to 3/4 inch thick. Sprinkle the top of each log with white sparkling sugar. The sugar adds a delightful crunch to the finished cookie. 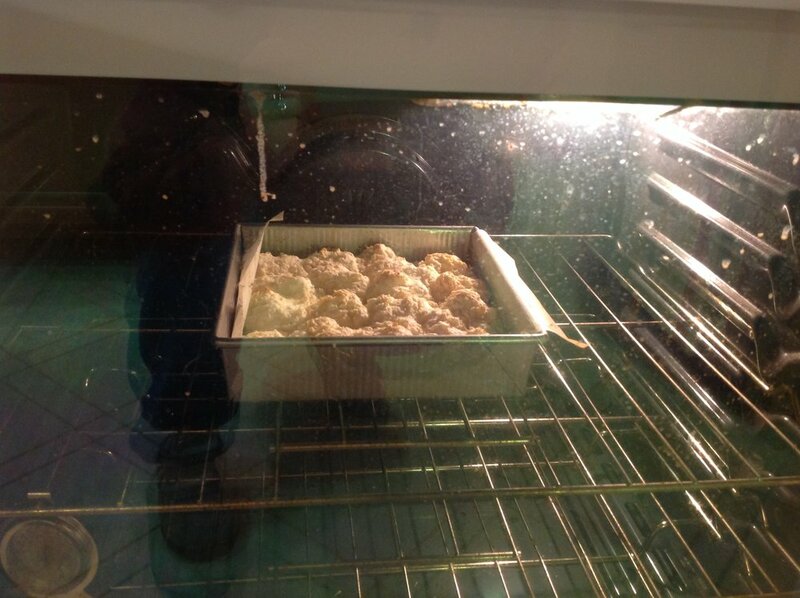 Slide the baking sheet into the preheated oven and bake the biscotti for 25 minutes. Remove the biscotti from the oven and allow to cool for about 15 minutes. While the biscotti are cooling, reduce the temperature of the oven to 325 degrees for the second bake. After about 15 minutes, slice the biscotti into 1/2 inch slices using a serrated knife. Remember to slice the biscotti cleanly in up/down motion. Don't saw the biscotti as this will cause the cookies to break apart. Set the biscotti on edge on the baking sheet and return them to the oven for the second bake. Bake the biscotti for another 25 minutes. This will yield chewy biscotti which are golden at the edges. If you prefer biscotti to be harder in texture, bake them for an additional 10 minutes or until they reach your desired degree of doneness. And there you have it: Harvest Pumpkin Biscotti with cinnamon chips and dried cranberries. If you love pumpkin spice flavored treats, these biscotti are for you. Happy baking, dear friends and Happy Fall! Fall Baking Ingredients: Have You Discovered Boiled Cider? One of the quintessential flavors in the fall baking repertoire is apple. Apple pie, apple scones, apple cake, apple bread, the list goes on and on and on. Here in Southwestern Pennsylvania we have access to a variety of locally grown apples and as we get deeper into fall the selection grows. So it goes without saying that I bake a lot with apples during the fall season. And one of my favorite ingredients for fall baking is apple based: Boiled Cider. I discovered boiled cider about 4 years ago. While perusing recipes on King Arthur Flour's web site I came across a recipe for apple cider caramels. Apple cider caramels? MMMMMMM. Sounded really good to me so I clicked on the link and reviewed the recipe to see if I had all of the ingredients on hand. That's when I saw it - boiled cider. I was intrigued - did that mean I had to boil down cider? There was a link for that ingredient so I clicked and was redirected to KAF's shopping page for this delectable fall delight. Dark brown and syrupy, intensely apple, boiled cider is made in, where else, Vermont by Woods Cider Mill. The Woods family has been making boiled cider since 1882. WOW! If a product has been in production for over 100 years it must be good. And it is. You can pour boiled cider as is on pancakes or waffles. Or mix it with 10x sugar for a quick apple glaze. Or add it to your favorite apple pie filling. Or add it to your favorite apple quick bread, scone or bar cookie recipe. Simply stated, boiled cider is my not-so-secret ingredient for fall baking which bumps recipes from good to GREAT! Find boiled cider on KAF's web site or Amazon or order directly from Woods Cider Mill of Springfield, Vermont. You will be so glad you did! Happy Fall Baking! If you read my blog regularly, you know that King Arthur Flour has a prominent role in my baking. King Arthur's all purpose, bread and whole wheat flours (both traditional and white) are the only wheat flours that I use. Many recipes that I feature here on The Peel were created and published by King Arthur Flour in cookbooks and online. Today, I want to tell you about another King Arthur Flour product that I love - Sift Magazine. Sift Magazine replaced another longstanding KAF publication, The Baking Sheet, about 18 months ago. Each issue of Sift is chock full of baking tips, wonderful articles, gorgeous photography and, of course, spectacular recipes. See the pumpkin pie there on the cover of the current issue? My friends, that pumpkin pie is, hands down, the best pumpkin pie I have ever made. What makes it so good? A secret ingredient in the filling. Want to know what that secret ingredient is? Check out the recipe in Sift. The Fall 2016 issue of Sift includes many other recipes that I have not made before but which I have flagged for upcoming baking sessions this fall. For example, there is a recipe for a yeasted apple oatmeal bread. This recipe includes rolled oats, chopped fresh apple and chopped walnuts. Here's how it is described in the magazine by Susan Reid, the author of the recipe and the editor of Sift Magazine, "This tender, nubby bread gets its crunch from chopped walnuts. Spiced with cinnamon and sweet with bits of apple, it's the perfect autumn loaf." I mean, how enticing is that? I want to bake a loaf RIGHT NOW! You can bet I am going to bake this loaf. I'll let you know how it turns out. Do you like monkey bread? Well, there is an interesting variation on a monkey bread in this issue of Sift: Stuffing Pull Apart bread. Chunks of buttery, herbed whole wheat bread are rolled in a filling made from traditional stuffing ingredients, then layered in a bread pan with remaining filling and baked. Doesn't that sound fabulous? That recipe is slated for baking a later in the season. These recipes only scratch the surface of what Sift Magazine has to offer. Pick up a copy today and get baking! I am proud to say that I am a member of ABL - Association of Bacon Lovers. Bacon is one of those treats that I don't indulge in too often. But when I do have bacon in the house, I like to use it in creative ways in my baking. One dish my husband really loves is maple bacon biscuit bake, which I usually make on Christmas Eve morning. I'll be writing about that recipe soon. Today, I'm sharing with you a very simple bar cookie recipe that I found at King Arthur Flour's web site: Chewy Chocolate Chip Cookie Bars. These bars are delectable: dense and chewy, buttery and caramelly. AND the recipe is tailor-made for personalizing with your favorite cookie add-ins. This week, I had some bacon in the fridge that I needed to use so I decided to jump on one of the latest baking crazes - Bacon Chocolate Chip cookies. But I'm too busy to scoop single cookies so I decided to make chewy chocolate chip bar cookies and to substitute bacon for some of the chocolate chips. Sound good to you? Me too! Let's bake! While your oven is preheating to 350 degrees, lightly grease a 9 x 13 pan. I like to use butter for this task. You want to melt 2/3 cup salted butter in a microsafe bowl. Add the melted butter to the bowl of your mixer to let it cool while you gather the other ingredients. Let's get the dry ingredients together first. In a medium sized bowl, whisk together 2-3/4 cups AP flour, 2-1/4 teaspoons of baking powder and 1/2 teaspoon espresso powder. The espresso powder is optional. I always use it in chocolate recipes because it helps to enhance the flavor of the chocolate. In the bowl of your mixer, add 1 pound (yes, pound!) of light brown sugar to the melted butter and mix it together. Then add to that mixture 3/4 teaspoon table salt, 1 teaspoon of vanilla and 1/4 teaspoon vanilla butternut flavoring. The vanilla butternut flavoring is another optional ingredient. I use it because it gives a wonderful nutty note to the flavor of the bars. If you don't have it, don't worry. Your bars will still be tasty. Next, beat in three large eggs to the butter/sugar mixture. Remember, add the eggs one at a time and beat the mixture well after each egg to ensure proper incorporation into the batter. What does that mean? Well, when you can no longer see any trace of the egg in the batter, it has been properly incorporated. What I tell kids when I teach them is beat the batter until it is no longer slimy from the egg. Take a look at the photos below. In the top shot, you can still see the egg, right? In the second photo, the sliminess from the egg has disappeared which indicates that the egg has been properly incorporated. Next, add in the flour mixture and beat on low speed until well combined with the butter sugar mixture. Now, for the add-ins. The original recipe calls for three cups of chocolate chips. I substituted chopped cooked bacon for one cup of the chocolate chips. This translates to one 12 oz. bag of chips and about 3/4 pound bacon, cooked and roughly chopped. What does roughly chopped mean? Big pieces of bacon and not small fine pieces. I wanted to be sure that the bacon is noticeable in the final cookie. Stir the chips and bacon pieces into the dough. Your cookie dough will be soft but not runny. Scoop the dough into the prepared 9 x 13 pan and press it evenly over the bottom of the pan into the corners. Smooth the top of the dough so that it bakes evenly. Slide the pan in the oven and bake the bars for 30 to 32 minutes. The bars will be puffed and golden; the top will be shiny. BUT, and this is very important, a tester inserted into the center of the bars will NOT come out clean. This is what you want. If you leave the bars in the oven until the center yields a clean tester, the bars will be overdone and hard and not the irresistibly chewy morsel that you want. When the edges of the bars appear dry after 30 to 32 minutes of baking the bars are done and should be removed from the oven, even though the center will still appear to be molten. As the bars cool, the center will solidify. Let the bars cool in the pan on a rack. Cover the pan and let the bars sit at room temperature over night. When the sun comes up the next day, be prepared for pure bliss. Buttery, brown sugary, nutty, chocolately, bacony chewy bliss! Believe me, it doesn't get any better than that. Would you like a cookie? Mix up a batch of these babies. You will be so glad you did.